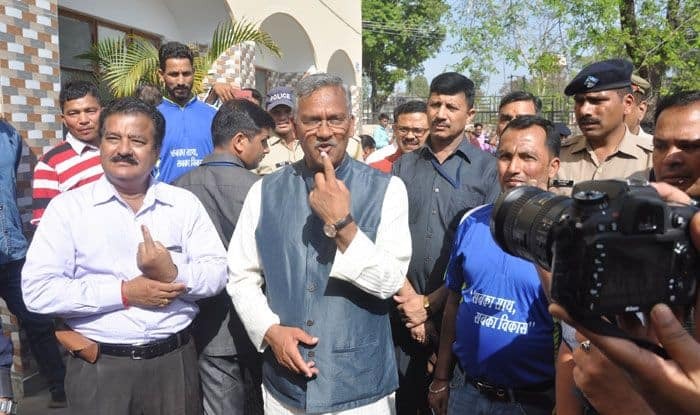 Polling in Uttarakhand’s five Lok Sabha seats saw 46.59 per cent voter turnout till 3 pm on Thursday, an official said. The fate of 52 candidates will be decided by over 78 lakh voters of the state, where all the five seats — Tehri, Pauri, Haridwar, Almora and Nainital — are being held by the BJP. High-profile candidates in the fray are ex-chief minister Harish Rawat, who takes on state BJP chief Ajay Bhatt in Nainital; ex-CM Ramesh Pokhriyal Nishank who faces Congress’s Ambrish Kumar in Haridwar; BJP national secretary Tirath Singh Rawat is up against BC Khanduri’s son Manish Khanduri in Pauri; and sitting MPs Ajay Tamta (Lok Sabha) and Pradeep Tamta (Rajya Sabha) in Almora.